If it hasn’t been done by the fish monger, cut out the blood line that runs along the length of the fish, where the spine usually is. If you do not remove this, the dish will become bitter. Take the fish and place it flat on the board. Using a sharp knife, run the knife along the length of skin until you totally remove the skin. Make sure the knife is ‘tight’ or flush on the board to avoid taking off too much of the flesh. Finely slice the fish into thin slices across the fillet, no more than 1mm thick and place it into a bowl. Squeeze the lime juice all over the fish, season with sea salt and pepper and mix through with extra virgin olive oil. 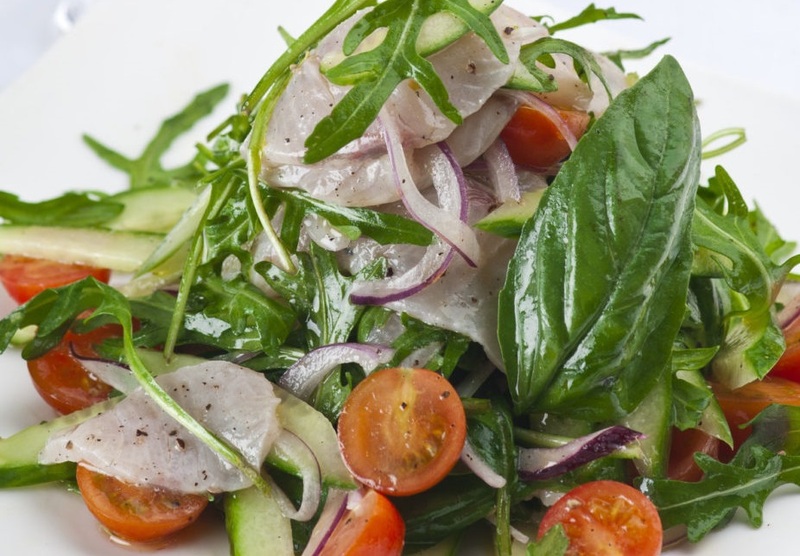 Place the cherry tomatoes, red onion, baby rocket, watercress and basil in the bowl and mix through.